There is no wonder why many homeowners prefer solid hardwood flooring. It’s strong, durable and helps add value to any property. On top of these traits, hardwood floors look slick, elegant, and have the beauty that lasts a lifetime. They never get out of trend. If you pick solid hardwood as your flooring of choice, the only thing that you have to think about is the style. In that regard, let us be of help with this list of top hardwood flooring styles for your home. Solid hardwood also has varieties of wood species, colours, finishes, and widths. You should choose base on your home location, activity level and the budget that you have. First of the top hardwood flooring styles is a departure from the usual hardwood flooring with narrow planks. Having wider and longer pieces of solid hardwoods will result in fewer seams, which helps create a more authentic wooden floor look. When laid down together, they make rooms appear larger and classier. If you’re going for a full-home renovation with one flooring style, a wide-plank hardwood floor is very ideal because it will create smoother transitions between rooms. In terms of sheen level, the most popular and stylish hardwood floor finish right now is satin. It’s a low-lustre level of finish, which is between matte and glossy. Satin-finished hardwoods don’t have eye-catching glossiness but still have some sheen. This style is favourable to families with children and pets, as satin-finished hardwoods show footprints, dirt, and other imperfections less compared to glossy ones. On the other hand, the satin finish still has enough sheen to make it more contemporary-looking. 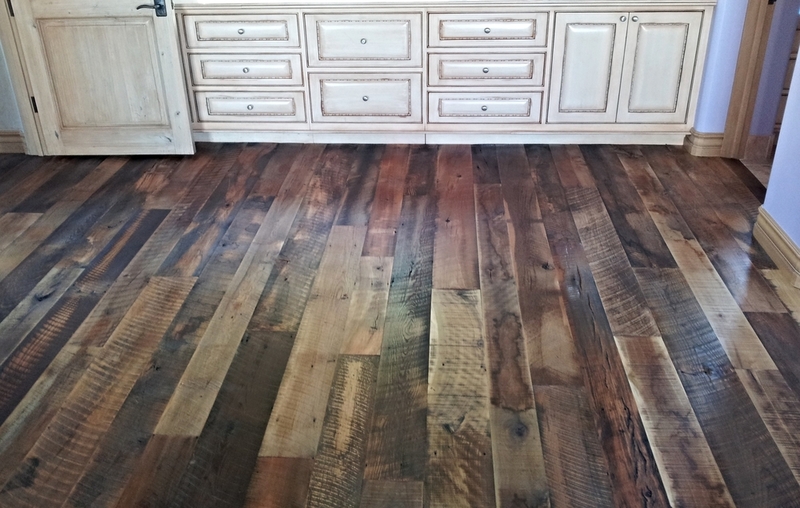 If you want to feel closer to nature, then choose reclaimed wood for your next home flooring. Reclaimed woods are processed woods which came from antique lumbers like parts of old barns, warehouses or even old wine barrels. They give the rustic feel to a property, which adds more character and beauty. This hardwood flooring style fits homeowners who love exotic looks and those who are into the preservation of history. Light-coloured hardwood flooring is very welcoming and adds more brightness to your home. It promotes the feeling of happiness. Homeowners who are aiming for a more casual and cheerful atmosphere should go for this style of hardwood flooring. Aside from the mood it creates, it also hides scratches and specks of dust well compared to dark-coloured flooring. Woods with natural colours of beige, grey, pale gold and beach white are preferred in this style. Some of them are light oak, birch wood, maple, and hickory. The individual planks on this hardwood flooring are hand-scraped to produce a refined surface, which shows the natural marks of the wood. The unique texture and natural colour of hand-scraped wood flooring make it very attractive for property owners. Much like with reclaimed wood, it promotes the feeling of natural outdoors which appeals to many people. You can choose hardwood floors with subtle scraping, deeper scraping, or something in the middle. Hand-scraped hardwood floors are best for rooms with high traffic, which are prone to dents and scratches. Any of these top hardwood flooring styles will transform your home and give it the sophistication and beauty that no other types of flooring can. To achieve the best hardwood flooring installation for your home, we recommend that you hire professional help. Contact us at BC Best Flooring for all your hardwood flooring installations in Burnaby and Vancouver.